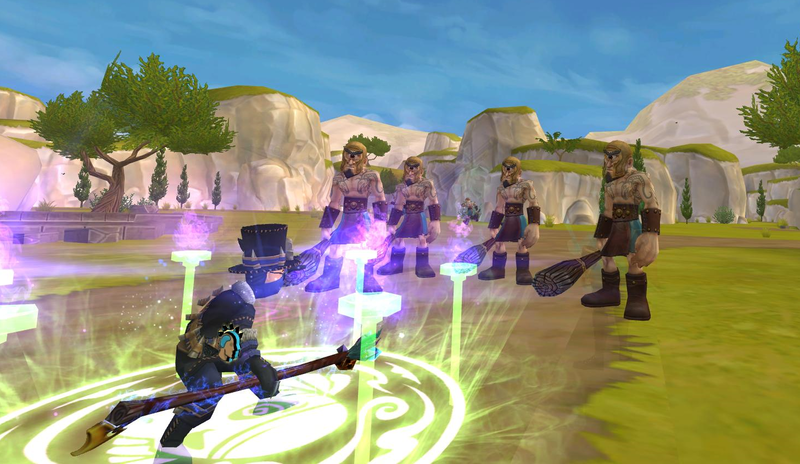 Around the Spiral with Edward Lifegem: Questing My Witchdoctor Again / Randomness! Wow, it's been forever since I've made a post that had nothing to do with the other amazing game that I shall not name. Recently, I started questing my witchdoctor with Autumn Walker's witchdoctor. It's actually been a few years (which is crazy when you think about it) that I've last quest this pirate. I thought it was about time to quest him again especially since witchdoctors are my favorite! Autumn and I started questing again towards the middle of Valencia 2. For our first quest together, we had to fight Cyclops and a few.. bleh... snakes! I think what made fighting snakes fun was that you can attack them from far away if you're a witchdoctor. Most other pirate schools require you to run right up to the deadly snacks (yes, I purposely did that - it's a Suite Life on Deck). Just naming off all of the amazing things about witchdoctors! Okay, I'm being very random today and not talking much about what we did on the game, but at least we made it to level 67 - 3 levels away from level cap! Why did I ever stop questing this pirate or any of my other pirates? I think it's time to bring back my old-school Pirate101 posts, whether they're random like this or not. For now, I think I'm going to end this post so you can enjoy the rest of the song above. I'll make an update post once we finish Valencia 2. Until then, I'll see you around the skyways. Thank you so much for reading! I mean, look at that! Definitely my favorite game for screenshots!